Not to be confused with Magnet Block. Three Minis walking near three Magnetic Blocks. A Magnetic Block is an object resembling a Pink Block in the Nintendo DS game, Mario vs. Donkey Kong 2: March of the Minis. They first appear in Magnet Mania, the fourth floor of Mario's Toy Company, and later are seen in Spooky Attic. 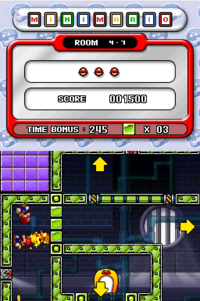 It is, as its name suggests, a magnetic block, that is green in color, much like the other magnetic objects in the game. If touched on the Touch Screen during gameplay, the blocks disappear and turn into the outline of a square, which the Mini Marios can walk through. The blocks that are erased become stockpiled on a small counter on the top screen. If this counter has any blocks in it, more Magnetic Blocks can be added onto the stage, even in different sets of blocks. However, if the outlines are touched again, they become full blocks, and the counter's number decreases. No more blocks can be added when the counter reaches zero, unless more blocks in play are erased. The Marios can walk on the Magnetic Blocks when they are set on the course to cross gaps and reach the goal, though. Since they are magnetic, Mini Marios can walk on them even if they are upside down or sideways. Unlike Pink Blocks though, Magnetic Blocks can not block the Minis' paths, as the Marios simply walk on the side of them when approached. Magnetic Blocks can be used in the Magnet Mania kit, Spooky Attic Kit, Special Kit 2, and Special Kit 3 when creating stages in the Construction Zone. This page was last edited on March 7, 2018, at 17:59.